A very refined and expressive miniature with bright and vivid colours in excellent condition by the hands of Simon Bening. Probably among the earliest witnesses of his art to survive. Completely unknown before and so far unpublished. The original decorative border of the page has been cut away at some stage while the miniature was mounted on strong paper that is black on the front and white on the back. A handpainted additional golden border frames the miniature before the black "passepartout". The leaf must have been mounted onto another surface before as there are some traces of glue. The miniature is slightly flaked at lower right of the painted frame; the script of the banderole, probably originally painted in silver in the left upper panel is scraped off; slight retouches in all panels, probably dating from the late 19th or early 20th century (as all other surviving leaves from the manuscript bear similar retouches, we might assume that they were executed shortly before the leaves were dispersed, thus shortly after the manuscript was dismembered). Upper left panel: white heightening of the kneeling Nicodemus' hair and beard, as well as the coat and eyes of Joseph of Arimathea standing on the right; upper right panel: white heightening of Nicodemus' hair and beard, his eyes also repainted; lower left panel: the body of the assisting figure on top of the transverse beam of the cross, probably the upper sleeve and the gown of St Mary below the arm of St John; lower right panel: blue area around St Mary Magdalen's arms and hands. Compared to the condition of the surviving companion leaves, the state of preservation of the present miniature is oustanding. The colours are bright and shining, no soiling or flaking within the miniatures. 1. From the Spanish Prayerbook that was made for the Spanish aristocratic family Enriquez de Ribera. The coats of arms of the Ribera family as well as of the Enriquez family are to be found in the border decoration of several companion leaves (see below). Paul Durrieu was the first to identify the coats of arms correctly. Ribera: Three fess vert; Enriquez: Chape ploye, 1 and 2: gules a castle triple towered or [Castile], 3, in base argent a lion passant proper crowned or [Leon]. See Alberto y Arturo Garcia Caraffa, Enciclopedia Heraldica y genealogica hispano americana, 57 vols. Madrid, 1828, vol. 31, pp. 32, 49-52, 80-81, arms, pl. 3a, 264 [Enriquez]; vol. 78, 220-21, 224, 249-50, arms, pl. 7a, 320 [Ribera]. See also the genealogical website of Sevilla , http://www.fundacionmedinaceli.org/casaducal/fichacasa.aspx?id=29xyz, or the private genealogical website of Paloma Torrijos (Historia y Genealogia, last updated 9 March 2009: http://palomatorrijos.blogspot.co.uk/2009/03/medinaceli-casa-de-pilatos-sevilla.html; last call 30 October 2012). The illustrious Spanish families of Enriquez and Ribera were united when Pedro Enriquez de Quinoñes (died 8 February 1492), the seigneur of Tarifa and of Alcala de los Gazules and the first Count of Los Molares, married first Beatriz de Ribera Hurtado de Mendoza, Countess of los Molares, and then, after her death in 1469, her sister Catalina de Ribera around 1475. Although Pedro's children from his first and second marriages, Francisco (?-1509), Fadrique (1476-1539) and Fernando (?-1522) were the first to use the united coat of arms of both family branches, the Riberas and the Enriquez, all the family property that they built or inherited was enhanced with the separate shields of both families, perhaps because certain titles were tied to one of the family lines. Fadrique became the first Marquéz de Tarifa in 1514 and was the third Conde de Los Molares since 1509. He had married Elvira Fernández de Córdoba "Elvira de Herrera" in 1499, but as the couple remained childless the marriage was anulled in 1502. Francisco, Fadrique's elder brother and only son between Pedro and Beatriz, had died in 1509 and was his predecessor in the office of the Conde de Los Molares. If, as will be shown, we assume for stylistic reasons, that the prayerbook was made around 1509-10, it could be very likely that it was Fadrique who commissioned it to commemorate his elder brother's death and at the same time celebrate his newly acquired title of "Conde de Los Molares". With the separate coat of arms of both family branches of his parents to ornate the borders of the prayerbook he could have intended to honour this heritage. Later in his life and for more personal purposes, Fadrique used a modified coat of arms, now including a quarter with argent three fess chequy gules and or. Both lines of the family continued commissioning illuminated manuscripts by Ghent-Bruges artists, including Simon Bening, in the first half of the 16th century. 2. It is possible that this so far unidentified leaf formerly was in the Ch. A. De Burlet collection in Berlin. "Only three of the four miniatures owned by De Burlet were sold, when they were attributed to Simon Bening, in Eine Wiener Sammlung, Berlin, H. Ball and P. Graupe, 12 May 1930, Pt. II, pp. 10-11, nos. 20-22, ills." Cf. Hindman 1989, p. 6, no. (8). Judith Anne Testa, 1991, p. 89 mentions five miniatures from the "Albert Figdor collection in Vienna", which are identical with the ones that Hindman identifies as the ex-De Burlet leaves. The leaves from this collection all have lost their border decoration, but at least the identified ones survived as isolated panels or lower or upper registers. However, the iconography of the known leaves from this collection all refer to the Life of Christ and his Miracles rather than to the Passion of Christ. All leaves formerly in the possession of Paul Durrieu have been mounted on wood; for an extensive discussion see Sandra Hindman 1989 and Judith Anne Testa 1991. 11. Cutting with two panels: 69 x 87 mm: Crucifixion, Veil of the Temple rent in two - Sotheby's London, Western Manuscripts and Miniatures, 6 July 2000, lot 35; Hindman 1989, p. 14 notes that this leaf "was recently purchased in Spain, [which] suggests the possibility that the manuscript remained in Spain following its initial execution and, moreover, encourages optimism about the eventual recovery of additional leaves and cuttings from the original manuscript." Simon was born around 1483, probably in Ghent or Antwerp, the son of the illuminator Sanders Bening and Kathelijn van der Goes, perhaps the sister or niece of the great painter Hugo. His family was also connected to Rogier van der Weyden: he could hardly have been born into circumstances more favourable for his artistic development. His career was long, prosperous and prolific, working for princely patrons in Spain, Portugal and Germany as well as in his homeland, and his achievements were celebrated by Guicciardini and Vasari as well as by his compatriots. Simon lived until 1561 and two self-portraits dated 1558 attest to his enduring artistic activity and ability. Simon Bening became one of the most famous miniaturists of the sixteenth century and his work is praised by contemporary international artists, chroniclers and historians alike during his lifetime. He had his illuminator's mark registered in the guild in Bruges in 1508, but settled permanently in Bruges only in 1517. He had five children, all girls, with Katherine Scroo, and his two eldest daughters, Alexandrine and Levinia took up the family business. Levinia later enjoyed a distinguished career at the courts of King Henry VIII and Queens Mary and Elizabeth (see Hindman 1989, p. 16 with a much more detailed biography of Simon Bening). It was a consistent feature of Bening's work that he made use of workshop patterns that had first been exploited back in the 1470s, and were often found in manuscripts associated with the Master of the First Prayerbook of Maximilian: this continuity is part of the argument for identifying the anonymous Master with Simon's father Alexander, or Sanders, Bening. Sandra Hindmann and Judith Anne Testa very convincingly proved that all the above-mentioned leaves once belonged to one and the same manuscript which does probably not survive and was doubtlessly illuminated by Simon Bening. They identified the iconography of every single scene, transcribed the texts of the numerous accompanying banderoles and related their wording to the Gospels of John and Matthew and the Acts of the Apostles (cf. Hindman 1989, Testa 1991, 1992). The major part of the scenes and of the direct speech that is indicated by the banderoles, refers to the Passion of Christ as it is described in the Gospels of St John. If the sequence of illuminations in the manuscript followed his report, the present leaf with the story of Joseph of Arimathea and Nicodemus, the Deposition and the Lamentation would have followed after sister leaf no. 11. Only one surviving leaf, no. 9 from the Philadelphia Free library, probably the recto, shows the complete justification of the manuscript and reveals the text and script, because all other leaves are either mounted on wood or have been mounted on paper and are illegible. This leaf tells us, that the pages were ruled for 20 lines, that the written space throughout the manuscript was 126 x 80 mm and that the text was written in Spanish. Morever, this page revealed a prayer different from those that would accompany either a Rosarium or a Book of Hours, which makes it more likely that the parent manuscript was indeed a prayerbook that was probably made according to individual requirements of the original commissioner. The exactly matching dimensions (i.e. with the written space, as the decorative border has been trimmed) of this newly discovered leaf together with the few lines of text that are discernible on the backside, and, above all, the typical narrating organisation of the page with four separate compartments to illustrate subsequent moments of the story, make it more than obvious that this miniature was also once part of the Enriquez de Ribera Prayerbook. This great and fortunate emergence of an astonishing miniature, that was unknown to date and was never published before, provides us with invaluable further insight into Bening's artistic development: Again, the iconography is very special and detailed, enriching the conventional cycle of the Passion of Christ. 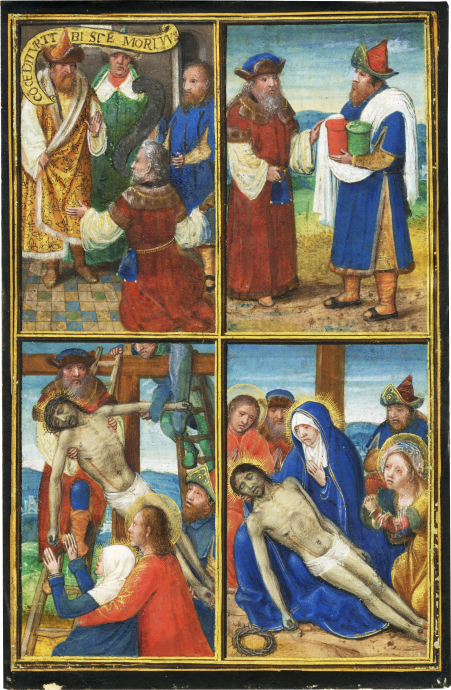 While a Deposition from the Cross as well as a Lamentation like in the lower compartments are frequently found in Passion Cycles that became so popular in the late Middle Ages and especially in Flanders, the scenes in the upper panels are rarely found: Joseph of Arimathea (?) kneeling in front of Pilate to ask for the body of Christ with Nicodemus standing next to Pilate, and Nicodemus and Joseph on their way to Calvary equipped with myrrh and aloe and white linnen. In this detail, the episode is only related in the Gospel of St John [John 19: 39-40] and the detail with the linnen is mentioned only by Mark [Mark, 15:43], while Matthew does not mention Joseph of Arimathea at all in this context. Luke [23:50-53] has a shorter version than John. The Gospels tell us that Joseph and Nicodemus were both high ranking members of society, both members of the Sanhedrin Council that had condemned Jesus to death, however, Joseph and Nicodemus had not consented to this decision. So far they had been secret followers of Christ, but they came out of hiding after Jesus' death, and Joseph intended to bury his body according to Jewish custom in his own tomb. In the first compartment Bening employed banderoles to indicate direct speech between the figures. While the scroll referring to Joseph (?) has been scraped off - it probably contained his words to ask for the body of Christ -, Pilate clearly answers "CO(N)CEDITUR TIBI S(t? )E MORTUUS" (The body will be granted to you). However, there is no direct speech in any of the Gospels relating this episode, which implies that either another or an additional text was used to illustrate this scene, or, that Bening collaborated with a theologian on this commission. Hindman tentatively suggested, that this additional source for the detail of the iconography and the text in the banderoles could be Pseudo-Bonaventura's Meditations of the Life of Christ or a similar text (cf. Hindman 1989, p. 4). The still unusual scene of Joseph of Arimathea in front of Pilate to ask for Jesus' body is however found in other illumination cycles from the artistic milieu of Simon Bening. For example in the Grimani-Breviary (Venice, Biblioteca Nazionale Marciana, Ms. Lat. 99 (2138), fol. 138v-139, the Master of James IV of Scotland painted an illusionistic carved wooden frame around the Crucifixion and the typologically related scene of Moses and the Brazen Serpent with a very detailed cycle of the Passion of Christ (cf. exh. cat. Illuminating the Renaissance 2003, cat.no. 126, p. 21, fig. 126a) including exactly this scene, but in a different composition. Simon Bening only had a small part in the illumination of this vast masterpiece of Flemish bookpainting, but, of course, he must have had access to this enormous reservoir of iconographic patterns that his senior colleagues had used. As has often been stated, Bening did use older models and patterns that go back as far as 1480 when the Master of the Prayerbook of Mary of Burgundy was active. Also, he must have inherited many drawings and patterns from his father, who certainly had apprenticed him, Alexander or Sanders Bening. Simon himself had depicted the scene of Joseph in front of Pilate in a full-page miniature in the Prayerbook of Albrecht of Brandenburg (J. Paul Getty Museum, MS Ludwig IX 19, fol. 311v; cf. online catalogue of the Getty Museum), but again, the figures are arranged quite differently and the scene is placed outdoors in front of a very impressive cityscape. Both, the Grimani-Breviary and the Prayerbook of Albrecht of Brandenburg were probably made later than the present leaf. The encounter of Joseph of Arimathea and Nicodemus on their way to Calvary with the ointments and the linnen in the second panel don't seem to have no iconographic parallel and seem to be unique. Bening explicitly focuses on these two figures in the four panels, next to the body of Christ and the Virgin Mary in the lower panels, but only these two appear in all four panels, and they are always recognizable by their clothes and exotic hats. It seems though as if Bening somehow confused these two characters in relation to the text of the Gospel: The text clearly states that Joseph is asking for the body, thus, the kneeling figure with the red gown in front of Pilate should be identified with Joseph. Also, the text states that Nicodemus is the one who brought aloe and myrrh (John 19:39), thus the figure with the blue dress in the second panel, which so far is very consistent. Mark however states that Joseph has bought the linnen (Mark, 15:46). The iconographical tradition of the Deposition always requires the figure of Nicodemus to gently lower Christ's body from the cross, which, in the third panel is the figure in the red gown, whom Bening had defined as Joseph before in the first and second panel. In the last panel, the Lamentation of Christ, the two main characters of the page witness the scene in silent devotion from behind St John's and Mary Magdalen's backs. It may be for compositional reasons that Bening chose the red gowned figure in the traditional position of Nicodemus in the Deposition, because it is set against the blue sky and the blue contours of the mountainous landscape in the background and at the same time directs the viewer's eyes from St John in the foreground to the dead body of Christ in the centre and middleground, whereas the colour blue in Mary's dress, in "Joseph's" cloak and the assisting figure on top of the beam forms a contrasting half circular movement in the opposite direction. Bening frequently used these means of continuity in subsequent illustrating panels to identify different figures to form a coherent visual narrative and to focus on special characters, perhaps to encourage meditation. In the cycle for the Enriquez de Ribera prayerbook, for example, he had very consistently focused on St Peter and Judas in Christ washes the Feet of the Apostles (no. 1), on Judas in the two panels of the Last Supper or on Thomas and Peter in the two panels of the Incredulity of St Thomas (no. 4). Bening might have been experimenting with the new or at least unfamiliar iconography of Joseph and Nicodemus in this leaf. In fact, Testa stressed especially the experimental character of the present cycle regarding the iconography, where Bening did apparently not exclusively resort to older models and patterns compared to later cycles in the Imhof Prayerbook (private collection, cf. Christie's London, The Arcana Collection, Exceptional illuminated manuscripts, part III, 6 July 2011, lot 26; the earliest dated manuscript to have been illuminated by Bening alone in 1511) or the Prayerbook of Albrecht of Brandenburg (c. 1520-25). She moreover states, that it is "the amplification of more conventional illustrated cycles that characterizes the Spanish Prayerbook." (cf. Testa 1991, p. 102) While Hindman also acknowledges the extraordinary variety in the iconography of the Passion cycle, she links it closer to the famous Stein Quadriptych in the Walters Art Gallery in Baltimore (MS 422, consisting of 64 miniatures - 68 x 52 mm each, now framed as a narrative cycle in four large wooden frames), which is now dated in the late 1520s or even later (cf. cat.no. 146 in Exh. cat. Illuminating the Renaissance 2003, p. 458 f.; Hindman 1989, p. 18). In fact, she observes many parallel figures, like Judas or St Peter for example, many similar spacial settings and even the same way of depicting the halos in both cycles. Also the following two compartments with the Deposition and the Lamentation link the leaf very closely to other works by Bening's hand, as he had used the pattern at various stages of his career in other now famous cycles, namely, again, in the Stein Quadriptych, in the Prayerbook of Albrecht of Brandenburg, and in the Prayerbook for Joanna of Ghistelles (dated c. 1516, London, BL, Egerton Ms 2125, fol. 154 v, cf. exh. cat. Illuminating the Renaissance 2003, cat.no. 141, p. 452, fig. 141). Although he employed differing stages of close-up in all mentioned cycles, a technique that became so typical in his oeuvre, the general composition scheme remained the same. As Bening had to focus on usually marginal figures of the story in the Enriquez de Ribera manuscript, he was forced to "zoom out" a bit in order to include all the figures in the picture. Moreover, in these tiny picture frames he hardly had the space to indulge in more technical refinement. However, a striking parallel with the Stein Quadriptych is indeed, that, as Thom Kren observed, the "sequence from the Deposition to the Entombment is told in four consecutive miniatures, but through the subtly altered placments of Christ's body, these miniatures suggest the continuous motion of his corpse from the cross to the grave." (cf. Illuminating the Renaissance, p. 458f.) It is exactly the declining movement of Christ's body from the left towards the right lower panel, restricted to two panels here, which serves as an additional instrument to "heighten the immediacy of the story by knitting together successive narrative moments visually, sparking the sensation of minute-by-minute storytelling." (ibid.) In addition, the group of the Virgin Mary holding the dead body of her son with her right hand while directing her left in a gesture of grief to her chest also appears quite similarly in the other Passion cycles. Mary Magdalene on the right wrings her hands in agony, her face is grief-stricken. Her pose and even the colours of her dress, which Bening had reused a couple of times, basically goes back to Rogier van der Weyden's famous panel painting with the Deposition in the Crucifixion triptych (Madrid, Museo del Prado), made between 1435 and 1440. Stylistically, this leaf shows both, Bening's elaborate art of endowing his figures with emotionally expressive features (here especially St Mary, St Mary Magdalene, but also John and Pilate) as well as of guiding the viewer's eyes through the visual narrative by means of colour scheme and composition. At the same time though he treated the settings of landscape and interior less elaborately or sophisticatedly than we would expect from the later work of a master like Bening. Some figures for example, close to the margins, like Nicodemus (?) in the first panel, Joseph in the third and Mary Magdalene in the fourth, seem a bit awkward, as if the artist was uncertain of how to achieve the close-up effect in arranging his figures on the plane of the image or of how to size them compared to the other ones in order to create illusionist perspective, which would plead for a younger or comparatively less experienced artist. Testa on the other hand argues, that connections between patrons of the Spanish and Portuguese patrons could already have been established by Sanders Bening, who so to say "bequeathed them" to his son. Moreover, it is inevitably also true, that Simon Bening had used older patterns throughout his career (cf. e.g. Thomas Kren: 'The importance of patterns in the emergence of a new style of Flemish manuscript illumination after 1470' in: Manuscripts in Transition. Recycling manuscripts, texts and image: Proceedings of the International Congress held in Brussels, November 5-9, 2002, Paris, Louvain and Dudley/Mass. 2005, pp. 372-373), which often makes it very difficult to date his works. This, together with the occasional stylistic awkwardness, and the iconographically experimental character make Testa believe that the Enriquez de Ribera manuscript illuminations must be among the earliest witnesses of Simon Bening's art that we have today. She states: "In comparison to Bening's landscapes in the Brandenburg and Beatty [Rosary in Dublin, Chester Beatty Library, MS W 99] manuscripts, the outdoor settings of both the Spanish Prayerbook and the Beels Prayerbook [today identified as the Imhof Prayerbook] miniatures appear much less accomplished. Of the two, however, the Beels illuminations seem more advanced." (Testa 1991, p. 106) Hence, she argues, the manuscript was probably made before the dated Imhof Prayerbook, thus around 1509-1520. She then continues: "This date would account for the occasional awkwardness, the experimental qualities and the lack of variety and sophistication in the spacial settings." Also, Bening had employed trompe l'oeil borders in the Imhof Prayerbook, which is dated 1511. Moreover, she sees stunning compositional parallels between the panel painting "Virgin enthroned" by Gerard David, dated 1509 (Musée des Beaux-Arts, Rouen) and made in Bruges, and Bening's depiction of Pentecost in this cycle (sister leaf no. 10, see Hindman 1989, p. 13). (ibid.) Bening could have seen this painting in 1509 when it was still in Bruges, before it was delivered to its commissioner. While it is true that Bening was influenced by Gerard David and sometimes even collaborated with him, the artistic relationship between these two artists was more productive in a later phase of Bening's work. It is however striking that the year 1509 (or 1510) seems to be of a certain relevance on both sides of this commission: If the Enriquez de Ribera manuscript in fact preceded the production of the Imhof Prayerbook for stylistic reasons, if Bening based his composition of Pentecost in this cycle on David's painting of 1509, it could hardly be coincidental that Fadrique Enriquez de Ribera would have had two reasons to commission a prayerbook that commemorates the death of his elder brother Francisco and celebrates his appointment as Conde de Los Molares, both related to his family heritage. Two further Durrieu leaves: Sotheby's, 23 June 1992, The Arnhold Collection, lot 22, now in a private collection in Belgium; which ones?